Knowing what you are going to receive, how and when you are going to get it, and how much it will cost all go hand in hand. Too often, sellers of natural gas get blinded by the complexity behind the marketing and price management effort, leaving them vulnerable and in many cases, undervalued at the well head. Marabou brings clarity and transparency to this process. We provide not only purchasing services, but complete price management so you may plan your production with surety. We will develop your options, explain them clearly, implement your strategy and manage the results. The possibilities are extensive, the opportunities are exceptional. 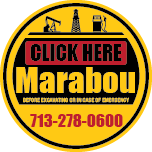 If you have never had a firm, show you how experienced price management can benefit you, give Marabou a call today!